Second Skin is a great new range from Charnos, blending warmth, versatility and fashion. The fashion comes from its minimalist chic spirit and the versatility is all in the black or grey colouring that makes it go with anything. 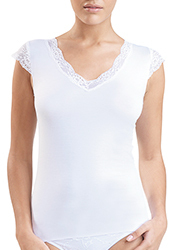 But what's more, this camisole has a thermal fabric called Heatgen, which is superbly soft and insulating. So you will have the cosiest top for winter, that also leaves your arms free in case you don't want to be too stifled or want to pair it with something else.